Layers of tangy non-fat Greek yogurt, sliced fresh strawberries, and granola spooned into a glass is a fun, healthy and delicious way to start the day. These strawberry yogurt granola parfaits will fill you up without weighing you down. But, I need to be honest here. Layered fresh fruit and yogurt parfaits are not something I make during the week. They’re just a little too fussy. Though, not as attractive, it tastes just as good and saves a few minutes. But on the weekends, when I have a little more time, I like to fancy things up a bit. 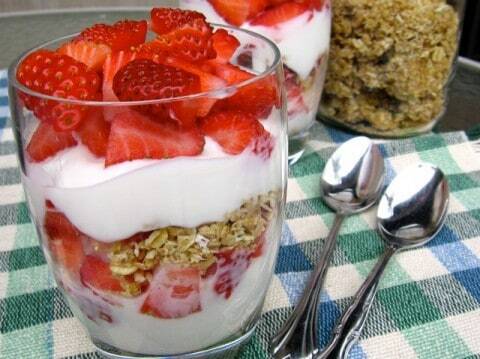 And these strawberry, yogurt and granola parfaits do the trick. To keep them light and healthy, it’s important to choose your ingredients carefully. There are huge variations in the amount of fat, calories and Points values among yogurts and cereals, especially granola. I’m a huge fan of non-fat Greek yogurt. If you’re not, just choose your favorite yogurt and adjust the WW Points values accordingly. Another trick is to drizzle your honey, maple syrup, or agave, over the yogurt instead of stirring it in, so you can really taste it and be satisfied with less. And go heavy with the Zero Points value fruit and light with the granola, which adds great flavor and crunch, but can be high in Points. So use just a sprinkle. And if you are feeling especially ambitious, you can even make your own homemade granola. It’s a treat, but not something I do all the time. According to my calculations, each parfait has about 205 calories, *5 Weight Watchers PointsPlus, *5 WW Freestyle SmartPoints. 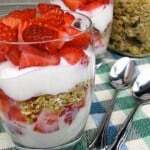 If you’ve made this strawberry yogurt granola parfait, please give the recipe a star rating below and leave a comment letting me know how you liked it. Spoon half the yogurt into a glass. 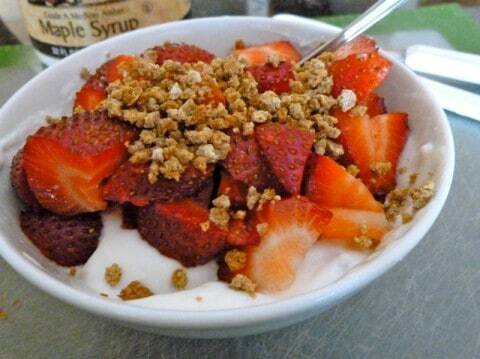 Drizzle the yogurt with half the honey. Top with half the berries. Repeat with the remaining yogurt, honey, and berries. Serve immediately to prevent the granola from getting soggy. Nutritional Estimates Per Serving: 205 calories, 1.1 g fat, 36.9 g carbs, 3.7 g fiber, 14 g protein and 5* PointsPlus value. Substitute the strawberries with other seasonal fresh fruit of your choice. 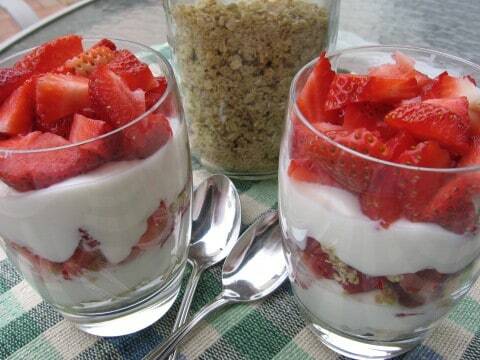 Love yogurt parfaits. I’ve been making really low-fat (2 T for 2.5# ) granola lately; mine has no white sugar, though it contains maple syrup, applesauce, and honey. On my blog if you want to try it! Thanks, Alyce. I’m a big granola fan and will check out your recipe. Thanks for sharing your thoughts about sash windows northen ireland.